The LaLa Lunchbox and LaLa Breakfast apps help families say goodbye to meal planning stress, and in the process, also help families to save money and time. The apps are easy for kids and parents to use. Choosing meals has never been easier. Kids simply select a food category and swipe their choices into the monster's mouth from a large selection of items in the Food Library. Along the way, they learn the building blocks of a balanced meal. Parents can easily personalize and edit the items available to their kids and the number of items permitted at any time using the settings button on the home screen. Once selections have been made, click done and swipe to plan the following day. Lunchbox users select from the following four food categories: Fruits, Veggies, Proteins and Snacks. Breakfast users select from the following four food categories: Eggs, Grain, Protein, Produce. When packing lunch or making breakfast, simply press the "List" button on the top right corner (it looks like three lines) to reveal an easy-to-read list of your child's choices. Use the "Calendar" button (top right corner) to plan ahead or look back at previous weeks. Click the "Star" button on the left to save, access and edit favorite meals and to repeat meals. Want the same breakfast several days in a row? Easy peasy. Want the same lunch every Tuesday? No problemo. Want the world to know what your kid chose for lunch or breakfast? Share it with your pals via email, Twitter, Facebook or text message. Easily manage your Food Library. 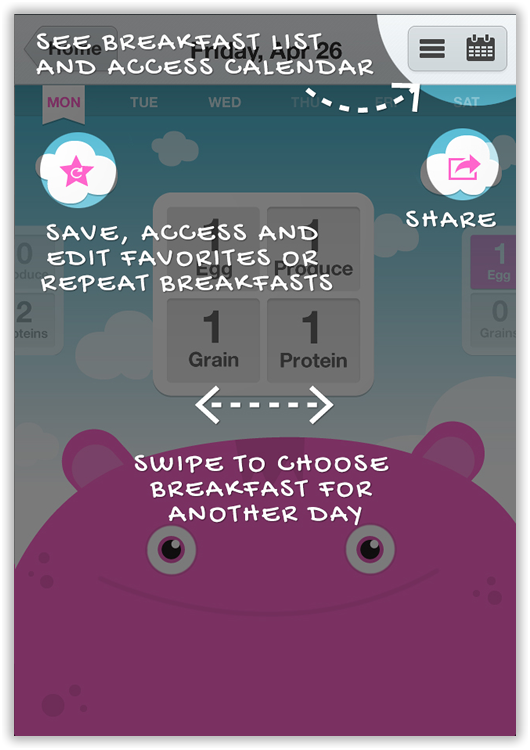 LaLa Lunchbox and LaLa Breakfast allow parents to manage the foods available to their kids via the Manage Food Library button within Settings. *The Settings button is the gear-looking button on the top right corner of the home screen). Allergies, dietary restrictions, seasonal availability and food preferences can all be taken into account. Switch weeks to plan another week's worth of meals or to look back on previous weeks.